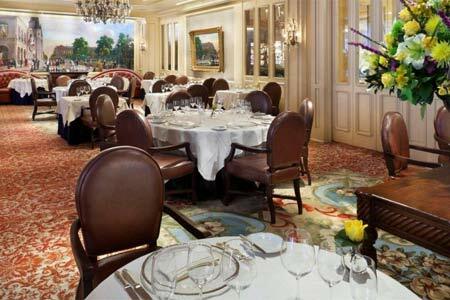 Old-world elegance abounds at The Grill Room. : Sitting just above the lobby of the Windsor Court Hotel, The Grill Room evinces an elegance that is apparent from the see-and-be-seen adjacent Polo Club Lounge to the dining room. On one end, a grand piano sits opposite a wall featuring striking 17-foot murals by local artist Auseklis Ozols. Despite an inordinately high chef turnover rate over the years, the place has managed to maintain its status among the city's premier fine dining spots. Chef Daniel Causgrove, who counts Le Cirque and Café des Artistes among his old stomping grounds, is a native New Yorker who has learned his culinary skills the old-fashioned way. A standout on the distinctive dinner menu is the bacon-wrapped pork tenderloin. Roasted Gulf snapper and blackened grouper are among the very few seafood offerings. The wine list includes about 600 selections, with about 30 by the glass; complex and constantly evolving, it is drawn up by a well-informed sommelier, who is eminently helpful at every table. For dessert, we suggest the tempura banana bread pudding, but then again, the pastry chef comes up with creative offerings daily.